One of the first foods I fed my son was applesauce. He loved it from the start. Even now at one-year old, he still eats applesauce every day. Mostly, I mix it into his oatmeal each morning, but sometimes he eats it as it is. 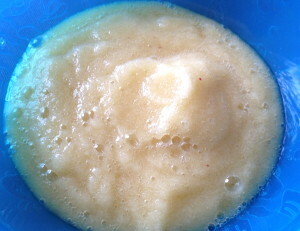 The great thing about homemade applesauce is that it’s easy to make and it can be for anyone: babies, children, adults! Since apples are naturally sweet (especially if you use golden delicious), sugar is not necessary. 1. Wash, peel, core and slice apples. 2. Place apples in a microwave-safe dish. Cover with plastic wrap and cook 5 for 5 minutes. Let apples cool for about 5 minutes. The apples should be soft, easily pierced with a fork. 3. Place apples in your blender or food processor. Puree to a smooth texture. (You may add a little water if needed). 4. Spoon sauce into desired containers. Once completely frozen, you may remove from containers and place in freezer bags if desired. This entry was posted in Baby Food and tagged baby food, homemade applesauce. Bookmark the permalink.